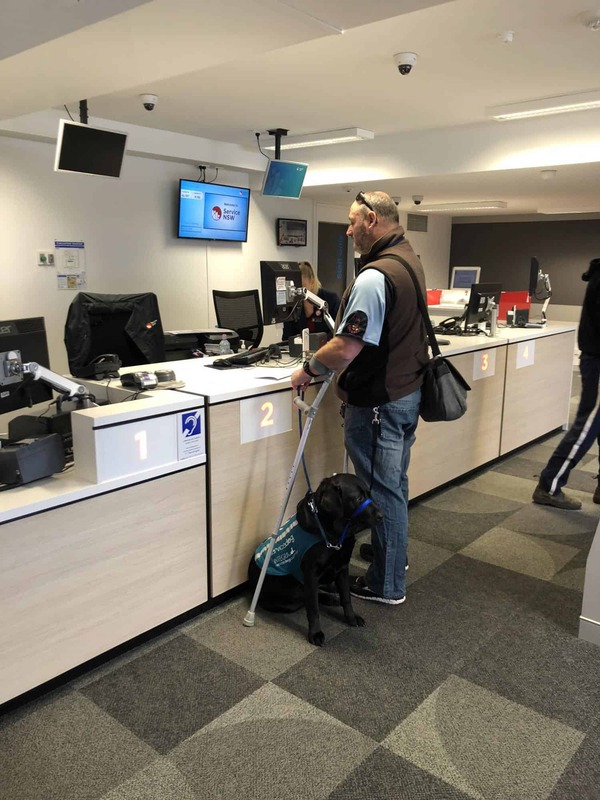 Since being matched in June 2017 with my Service Dog Leroy, together we commenced and completed training in November 2017 by Guide, Hearing and Assistance Dogs (GHAD) for the Public Access Test (PAT) Certification. I have thoroughly enjoyed the journey with Integra and this experience has given me back my life. It has helped me to stop living a reclusive lifestyle. I am now able to continue with regular graded exposure treatment for my chronic PTSD and anxiety which includes leaving the house and interacting with the community. I cannot thank Leroy and Integra Service Dogs Australia enough for this from both myself and my family. I had tried doctors and specialists, pills/medications and all the educational mental health courses possible to keep myself functioning normally day to day, week by week. However, I still wasn’t coping and able to function properly, so I looked into commencing a dog support program. I thought this would be a better form of therapy due to having had minor experience training both Golden Retrievers and German Shepherds in the past as pets which I really enjoyed. I had also seen the results of other past and present Australian Veterans/First Responders within Australia and Overseas using dogs as a form of therapy. This is what drew me to Integra Service Dogs Australia. I have been with Integra since June 2017. Being a part of Integra has given me something to focus on right from the very first meeting with Mr Johnson and Mr Lloyd. During the Public Access Test (PAT) training and after my certification, if I ever needed advice on anything they were always there to guide, correct and praise what I was doing. Having this support has helped myself become a better handler and boost my personal confidence knowing that I can go out into the community with Leroy and have a grounded experience. Before I had Leroy, it was normally a fight or flight experience. Every day as a team with yourself being the handler and having a service dog gives you a routine. A strict routine just like in the military because our service dogs need a leader to look up to, to follow and rely on. So, from the time you get out of bed, feed them breakfast, go for a walk, training, have fun by playing ball or tug with a rope and feed them dinner etc the service dog completely relies on you. Just like you rely on them to look after you when at home, or out in the community. Having that tight knit close bond with your service dog is vital for the success you have in the future throughout training, completing the PAT and for life. Since starting my training in June 2017, I have found that you need to be fully committed. Being given a Service Dog is a life-long commitment and you need to show that from your initial bonding stage, earning your coat, basic and advanced obedience and more advanced training towards PAT certification. Integra is firm but fair with training and very accommodating with Veterans and First Responders disabilities to meet your own personal goals with your service dog. For example, Mr Lloyd helped me overcome difficulties I have with “foot instability” while using travelators during the training sessions undertaken in shopping centers. 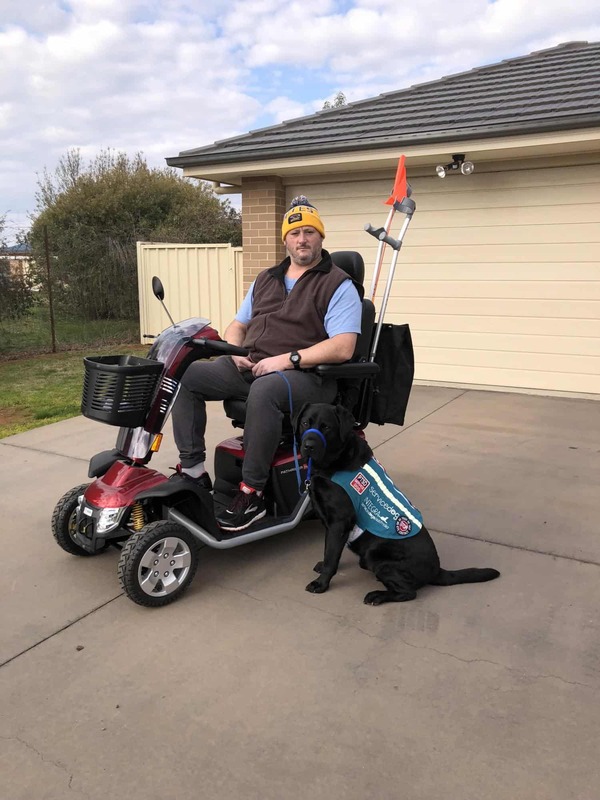 The support from Integra has enabled myself to re-integrate back into the community and live with my wife and children who have been 100% supportive of the changes they have seen in me since having Leroy. Being a part of Integra has given me back my life. It has helped me to stop living a reclusive lifestyle. I am now able to continue with regular graded exposure treatment for my chronic PTSD and anxiety which includes leaving the house and interacting with the community. When Ash first told me about wanting to get a service dog, I was so against the idea, thinking ‘Great, another body to care for!’ I spoke at length with Ash and supported him in his application to have a service dog. I am now the first to admit that we should have looked in to it sooner. Ash is functioning so much better with the assistance of Leroy. Leroy has fit into our family so well. 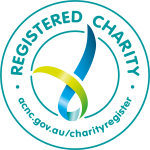 To witness his response to Ash’s episodes of anxiety and responding to triggers that Ash has not even registered have occurred. I have witnessed the bond that they share grow and grow insurmountably. I have personally found the support of Mr Johnson and Mr Lloyd to be phenomenal. Nothing is ever an issue. I look forward to ongoing work with Integra Service Dogs Australia.